Would you ride the Star Trek Enterprise or the Star Wars Millenium Falcon? Would you rather live on Endor or Quo'nos, the Klingon homeworld? Would you be BFFs with Spock or Han Solo? 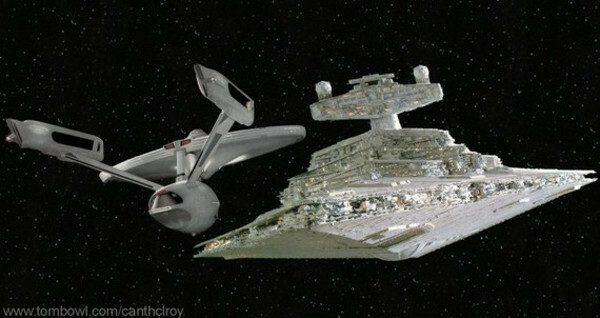 Image: Star Trek Enterprise vs. Star Wars Star Destroyer. The debate between which is better - Star Trek or Star Wars - will never be settled. But the question of which is a better world to live in can be settled right now. The line must be drawn here! This far! No further! It's phaser guns versus light sabers. Not as clumsy or random as a blaster; an elegant weapon for a more civilized age. Let's make this the definitive answer to the question. Tell your friends, tell your family. Get everyone you know to vote on this one simple question. Would you rather live in the Star Trek or Star Wars universe? Why? Who Played Your Favorite Catwoman? You and Mace Windu Anna. Excellent choice. I'd rather live in the Trek world. The Federation is pretty nice except when it's under attack by the Borg or Dominion or something. Like at Earth on Trek compared to Star Wars heck-holes like Tatooine or Coruscant. So really Star Wars is nice to visit but I don't wanna LIVE there, you know? Pat, it sounds a lot like New York. Star Trek - hands down! Star Trek. They have the replicator, transporter and they know how their ships work. Much as I love Han Solo, he only had Chewie banging around in some random floor panel and didn't know what the heck was going on. I lose! I picked the Star Wars universe because I'm hoping to hang out with Captain Solo. Trek! It's a post-scarcity society. Nobody is poor and everyone is free to do what they like. Star Wars universe, you're just as likely to be sold into slavery on Tatooine with a bomb implanted in your head. Not so much fun now, is it? I never thought of that Fushico. They don't even have money. On the other hand you can't be a bounty hunter. Star Trek. The political/economic/social systems are very different (and probably easier to live with) than those from Star Wars. sometimes i live in both... this is a tough one. phaser over light saber? Dude, if I can't be a Jedi, the answer is simple: Star Trek. I'd hang out at Deep Space Nine. I would rather live in the star wars universe. if you can make it, you could make it big; bounty hunter, swoop racer, smuggler, imperial hero, Republic hero, senator, computer hacker. then again, you could also loose big; slave, prisoner, bounty with money on your head, or maybe just dead. star trek is nice, but aside from starfleet and the like, its kinda average for the culture. ide wager that most folks don't even have a shuttle to their name the way we have cars and such.